Dr. Hustins spent her early years growing up in Bedford, NS, where her parents bred Labrador Retrievers. Later her family moved to a farm in Hants County where they had Hereford Cattle. Shelley’s interest and compassion for animals goes back as far as she can remember. Her Grandfather was the first Veterinarian to practice in West Texas. Shelley spent a lot of time with him and he helped her realize her passion for Veterinary medicine. Dr. Hustins went to the Nova Scotia Agriculture College from high school to study the pre-veterinary medicine/animal science program. 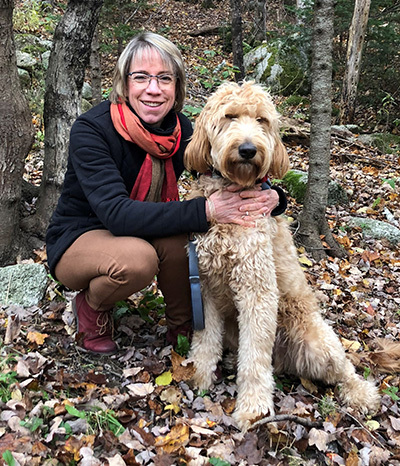 After completing the two year program, she went on to Guelph, Ontario, where she graduated in 1987 with her Doctor of Veterinary Medicine from the Ontario Veterinary College. She joined Cornwallis Vets in 1988 and has been enjoying the practice of small animal medicine ever since. In 2005, Dr Hustins became a partner in the business. Dr. Hustins has done many pencil sketches of her two children, Alyssa and Jamie. In 2009, the children’s book “No Room” was published for which she illustrated 18 colorful drawings. This is a heartwarming story about a cat that is caught out in a snowstorm one Christmas Eve, the story was written by Dr Peter Riddle. Outside of work, Dr. Hustins enjoys an active lifestyle with her husband, Peter.